[vc_row][vc_column width=”1/1″][vc_column_text]We’ve all heard that meditation & mindfulness are good for you. 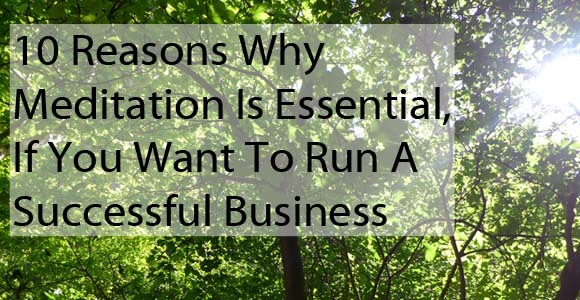 But did you know they can help you to GROW your business? In fact, many of the world’s most successful people make it a non-negotiable part of their day. And no, you’re not too busy. If they can, you can! And it’s easy, when you know how. Want to dive in and make changes? Ready to dive in and create the meditation habit? That Make You Feel Miserable? Live Q&A With Clare Josa: This month it’s all about MEDITATION & MINDFULNESS. Answering the 5 top questions I get asked about it – and any extra you have. Meditation? Mindfulness? Love it? Avoiding it like the plague? Vaguely curious? What are your excuses? Your questions? Whenever I go to meditate, I’m so tired, I fall asleep. What can I do? How do I stop my mind whirring when I’m trying to meditate? I know how to meditate, but how do I actually create the habit? 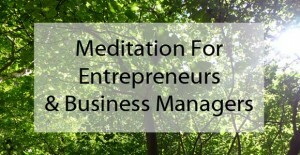 What’s my #1 piece of advice to someone who wants to meditate? I would LOVE to hear your answers to the questions I asked in the webinar, via the comments. 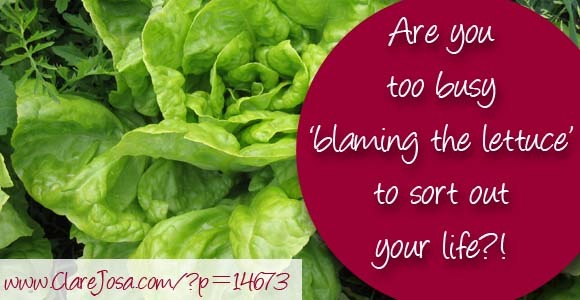 Are You Too Busy ‘Blaming The Lettuce’, To Sort Out Your Life? “When you plant lettuce, if it does not grow well, you don’t blame the lettuce. You look for reasons it is not doing well. It may need fertilizer, or more water, or less sun. You never blame the lettuce. Yet if we have problems with our friends or family, we blame the other person. But if we know how to take care of them, they will grow well, like the lettuce.Blaming has no positive effect at all, nor does trying to persuade using reason and argument. It’s not just about our relationships – the ‘blaming-the-lettuce-syndrome’ applies to EVERYTHING we create in our lives. If we fall in love with a dream project, but it doesn’t go to plan, we blame the lettuce. If our career falls apart or we don’t bag that dream promotion or amazing customer, we blame the lettuce. If we feel exhausted or fed up or miserable or lost or stuck or confused or stressed or anxious, chances are we’re blaming the lettuce. Whenever the warning signs come up that we’re blocking our Abundance – that we’re sabotaging our health, happiness, vitality, energy levels, relationships and success – we blame the lettuce. We do whatever we can to avoid looking in the mirror and taking responsibility for the choices we have made – for the thoughts, words and actions that were ours and ours alone. When life falls apart and Abundance flies out of the window, it’s much easier to blame the lettuce than to look in the mirror and do something about it. In fact, we go further than that. We don’t just blame the lettuce, we use it as our excuse – our justification for why things didn’t work out the way we wanted. But blaming the lettuce means you’re throwing away your personal power – you’re keeping yourself stuck, because the lettuce is never going to do anything to change things for you. Because YOU and ONLY YOU hold the power to make the changes your Soul has been dreaming of. You can always CHOOSE to change you thoughts, your words and your actions. And that can transform your experience of life. Let’s do it – right now! Sit or stand comfortably, with your back fairly straight, your chin tucked gently under and your shoulders relaxed, your eyes softly closed. Take a deep breath in through your nose and breathe out through your mouth with an ‘ahhh’ sound, as you let go of stress and tension. Do this 3 times. Now let yourself rest for a few moments, simply observing the physical sensations of your breathing – and if your mind wanders, gently guide it back to watching your breath. Keep doing this for the next few minutes, allowing yourself to feel grounded – and perhaps noticing the sense of relief as you let go of trying so hard and you stand in your Soul’s power. Now, when you feel that process has created a shift, with each in-breath and each out-breath, say to yourself, “I AM ABUNDANT!” Keep going for at least 10 breaths, allowing “I am Abundant!” to effortlessly permeate every cell in your body. When you feel ready, gently release the practice, dedicating its power to someone or somewhere who needs that energy – because sharing the energy helps it to grow. Open your eyes, have a good stretch and notice what has shifted for you. So how did you get on? What did you notice? Perhaps you’d like to tell me, via the comments? Which areas of your life are screaming at you (however silently!) to stop blocking your Abundance, to stop blaming the lettuce? It would be an honour to help you more on this, if your heart is calling you to dive in and make some changes. Want to dive in more deeply? And deal with your Abundance blocks? How about joining me us for my 28 Day Abundance Blocks training? Find out for yourself why people are raving about this course – and how it is empowering them to finally release the blocks they didn’t realise were holding them back: Click here to find out more & register now. I hope today’s technique has helped you. If it has, please do share it with your friends via Facebook / Twitter etc. And thank you for taking the time to run through it. Your ‘future you’ is busy doing a happy dance right now!